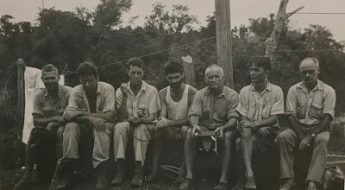 The Yale Peabody Museum of History has partnered with the Biodiversity Heritage Library Field Notes Project to digitize a selection of primary natural history field research. Over the last year, the Peabody Museum has made 69 of invertebrate paleontologist Charles Schuchert’s field notebooks available to the public through Internet Archive and BHL. Schuchert (3 July 1858 – 20 November 1942) was known for his seminal works on brachiopods, his unprecedentedly detailed and accurate paleogeographic maps of North America, devotedly supporting students academically and financially, and an unwavering dedication to his studies that resulted in over 236 published works, 130 paleogeographic maps, and more than 89,000 invertebrate paleontology specimens in the Yale Peabody Museum alone. Lore has it that his affinity for invertebrate paleontology was cemented when a worker digging a ditch near his home in Cincinnati casually tossed 8 year old Schuchert a fossil . Collecting such fossils from the local hills led to what would eventually evolve into the 2nd largest brachiopod collection in the nation . Even in those early years, Schuchert’s scientific rigor was evident as he carefully labeled each specimen under his care (even if his first specimen determination of “petrifaction of a nanny-goat’s horn” did turn out to be a coral) . At some point (sources variously say he was 11 or 17), he purchased The Paleontology of Ohio from a local drugstore and began his study in earnest. Despite the auspicious early years of this lifelong love affair, Schuchert’s paleontological career began late, and was not without obstacles. During his childhood, Charles’ mother Agatha worked in a sewing factory, and his father Philip managed to start a modest business making parlor tables. Charles juggled chores and homework with opening their shop at 7am and continuing work there after school. Upon completing the 6th grade, Charles left school and devoted his days to working in the furniture factory’s varnish room. In 1877, when Charles was 19, a fire broke out in the furniture factory and burned it to the ground. After emigrating from Germany and struggling to make ends meet for his small family, the devastation wrought by the fire overwhelmed Philip, and he sickened and died. But Charles, in one of the many instances in which he persevered against great odds, scraped together some $900, rebuilt the furniture business, and over the next few years expanded to become successful. In the same year as the fire, Charles befriended Edward Oscar Ulrich, another young man with a love of fossils. Ulrich had some university schooling and was appointed to manage the Cincinnati Society of Natural History collections. Shortly thereafter, Charles visited St. Louis to sell furniture and looked up an expert on crinoids, Dr. G. Hambach. From Hambach, Charles learned lithography, a skill which allowed him to assist Ulrich in publishing material on local brachiopods and bryozoans over the next several years. In 1884, there was another fire and once again the Schuchert furniture factory burned down. For the next 4 years Charles worked as a laborer in other furniture businesses until the renowned state geologist/paleontologist of New York, James Hall, came to visit Cincinnati. On seeing Schuchert’s collection and expertise, he hired Charles as his assistant. In Albany, Charles made a number of connections that would serve him well, including one with Charles Emerson Beecher, then faculty at Yale and staff at the Yale Peabody Museum. After some time spent studying Minnesotan brachiopods in Minneapolis, Schuchert joined the staff of the U.S. Geological Survey in Washington in 1893. That April he was sent to the Yale Peabody Museum to assist Beecher in preparing early carboniferous crinoids for display at the Chicago Exposition. Shortly after Schuchert’s return to Washington, he became assistant curator of invertebrate paleontology at the U.S. National Museum. Hand-drawn map to which Schuchert added notes over many years. This map was eventually published in the second edition of Outlines of Historical Geology (plate 28, map 1, page 230). 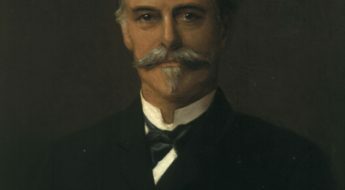 Upon Beecher’s sudden death in the winter of 1903, Schuchert was hired at Yale as professor of paleontology, curator of collections at Peabody Museum, and a director of the Sheffield Scientific School. At 46 years old with a 6th grade education, he set foot in a college classroom for the first time and taught his first college courses. This unorthodox appointment resulted in uniquely valuable solutions to common problems: when faced with bored students struggling to imagine geographical relationships between places they had never seen, Charles developed extremely detailed paleographic maps. Although researchers had been drawing paleogeographic maps since James E. Dana popularized them several decades prior , Schuchert revolutionized the practice by showing smaller time periods in his maps (on the order of only several million years, as opposed to entire geologic eras, which span several hundred million years). This smaller slice of time allowed Schuchert to represent a geographic area with exponentially greater precision. He argued repeatedly over the course of his career in papers, books, and lectures that mapping too broad a temporal span meant including so many geologic changes that the resulting model did not accurately portray any moment in history at all. An astute observation about the need for more detailed paleogeographic maps and their utility as stratigraphic teaching tools turned into a lifelong project as Charles undertook trip after trip gathering data, and spent long evenings painstakingly adding details to the array of maps on the custom desk he had built for the task . Schuchert eventually produced maps of North America spanning all of geologic time. In 1910, he published Paleogeography of North America, which would become the standard text on the subject, and is still in use today . 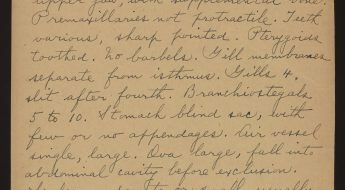 The countless carefully recorded observations that made these feats possible are retained in his field notebooks: a historical record of a historical record. The Yale Peabody Museum of Natural History is honored to have the opportunity to share these notebooks with you. We hope that they continue to inspire the dreams of budding researchers, and that through them Charles Schuchert’s unflagging devotion to his passion can continue to support the efforts of the scientists to come after him as he did during his years as teacher, mentor, and first and foremost: paleontologist. View Charles Schuchert’s field notes in BHL here. Knopf, Adolph. “Biographical memoir of Charles Schuchert, 1858-1942.” National Acad. Sei., Biogr. Mem 27 (1952): 363-389. Kaesler, Roger L. “Carl O. Dunbar on Charles Schuchert.” (1987): 406-410. Schuchert, Charles. Atlas of paleogeographic maps of North America. Wiley, 1955. Schuchert, Charles. “Paleogeography of North America.” Geological Society of America Bulletin 20.1 (1910): 427-606. Nicole Palffy-Muhoray is a Museum Assistant at the Yale Peabody Museum of History.